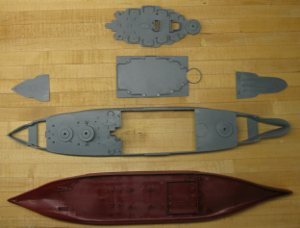 USS Arizona model kits - Here is a list of kits of the ill-fated US battleship. 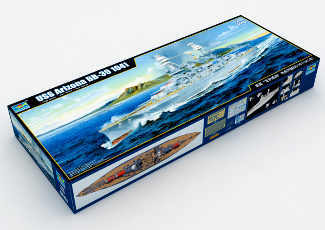 Plastic Model Kit Manufacturers include Trumpeter, Banner, Hobby Boss, Mini Hobby Models and Revell. 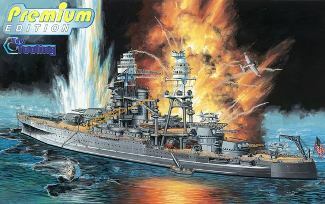 Looking for a USS Arizona model kit? Well, here is a list to make it easier to see what's available. 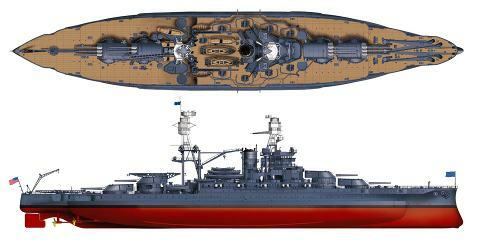 There are a lot of models of the famous American battleship to choose from. There is almost one for every scale, and at least one for every medium. For those who missed it, the USS Arizona was attacked and sunk at battleship row in Pearl Harbor on December 7, 1941 at a great loss of lives. 1,177 servicemen of her crew of 1,400 were killed. The attack on Pearl Harbor led to the United States actively joining the Allies in the Second World War. Her demise came in form of an aerial bomb dropped from a Japanese "Kate" bomber. The bomb struck her between the two forward turrets and reached the magazine. The bomb ignited her powder storage and set of a secondary explosion. The fiery inferno that followed ultimately sank and destroyed her. Her wreckage is today the sanctuary and memorial to the crew that lost their lives in the attack. There is no doubt her dramatic and tragic destruction is the reason for the vast number of kits made of the fateful battleship. This is the biggest USS Arizona plastic model kit available. At 1:200 scale it measures a massive 925mm long, and 160mm wide (35.5 x 6.25 inches), and with almost 1000 pieces, there is no shortage of details. This kit was released in 2010, so it's a modern design and comes with the main gun barrels made of brass, four sheets of photo-etched parts (including hand rails, cranes etc.). Another neat feature are the metal shafts and propellers. Building the kit out-of-the box will certainly produce a fine model. However, it is apparent the kit designers had to make some difficult judgement decision between price-point and level of detail. 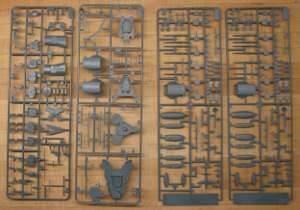 For instance, the secondary armament gun barrels and most of the crane and catapult parts are injection molded. Trumpeter realized there was a market hungry for even greater detail and released an upgrade Set for the USS Arizona. It is reasonably priced and well worth the money. 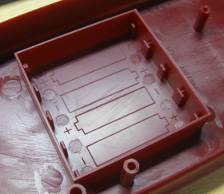 If that's not enough, there are even more photo-etch parts offered from third parties such as White Ensign Hobbies. Another cool detail is the Vought OS2U "Kingfisher" float planes she carried are molded in clear plastic. This way the canopy can be left clear when painted. I can't think of a simpler way with a better result. 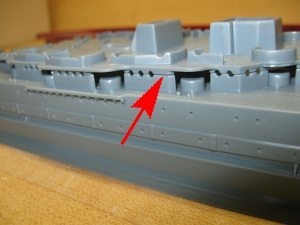 The hull comes in two parts split along (or slightly below) the waterline, much like many modern 1/350 scale ships. So, how much does this thing go for? Street price is around $240. At Amazon.com, the 1/200 USS Arizona model is going for well under $200. On ebay it often comes up for a little less, but be careful. Most of those are shipped out of South East Asia, which means you may have to pay customs fees etc. Personally, I'd get it from Amazon for peace-of-mind. This kit has been released under several different labels. When they developed the kit they were evidently using the age-old Revell-Monogram kit as a reference. While that may not have been the best solution, the kit is surprisingly good value. 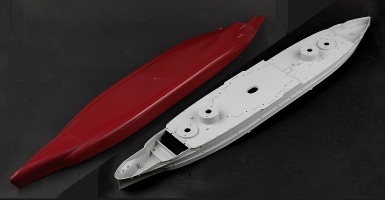 Just like its larger cousin, the 1/200 Trumpeter, this model comes with a hull that is split on the waterline. This is a huge advantage over the old Revell kit if you want to build a waterline model. This is not a top-shelf model like Tamiya or Hasegawa, but it's not terrible either. Considering how cheap it is compared to other 1:350 kits of this size, it holds tremendous value. Besides, this is the only 1/350 version of this ship at this time. At first glance it seems the way the upper hull is designed is overly complicated with unnecessary deck pieces. When you stop and think about it, you realize it's a pretty clever way to stiffen and stabilize the upper hull in the event you want to build it as a waterline model. On my sample, there was a sticker on the outside of the box that said "Static Model". Inside the lower hull is a molded in battery compartment to hold a number of AA batteries - a tell-tale sign this kit was originally designed as a motorized model. This is promising for those of us that are drawn to converting plastic kits to RC. The biggest issue with this kit is how most of the superstructure parts are molded. It is an unfortunate solution that is directly copied from the very old Revell kit of the USS Arizona. Lining up all the portholes is very difficult. The best fix is to build it and fill all the joint along with all the port holes. Once sanded and cleaned up the portholes can be drilled out again. In my opinion this kit is well worth the money, despite its flaws. All that I'm aware of can be fixed with some putty and elbow grease. There are also a multitude of aftermarket brass gun barrels and photo-etched rails and other details for this kit from the usual suspects: Tom's Models, Eduard, White Ensign and Lion Roar. Adding these can produce a truly impressive model. The price is right, which, as I said earlier, adds to the good value. It can be picked up at Amazon.com for around $35. At 1:350 scale it can also be converted to RC - not necessarily an easy task, but it can be done. Dragon Models have revamped some of its older kits and released them anew as the "Premium Edition". What they've done is re-tooling some plastic molds and adding new photo-etch details and decals. The result is a much higher quality kit than previously, but at a lesser expense than developing an entirely new kit from scratch. To the builder, this means more for your money, and an over all better value. This 1:700 Premium Edition by Dragon Models is hands down the highest quality injection molded kit of the USS Arizona at this scale. It too comes with a hull split at the waterline, so it can be built as either a full-hull or waterline model. The price for this kit is right around $30.00 from Amazon.com . This is an old full-hull kit at an old-fashioned box-scale of 1:426. For those of us that built this kit 30 years ago or more, the kit oozes nostalgia. Not quite the value as the 1:350 model, but still a decent buy if you can't afford the more modern kit. Not necessarily bad kits, but neither is as good quality as the Dragon Premium Edition. If you're not at the skill level of dealing with photo-etched parts, these kits could be a more economical option to hone your building skills with. There are several good quality resin kits of the Arizona in both 1:350 and 1:700. They all come with photo-etch details. Some of the manufacturers to look for include Tom's Models and Midship Models. To my knowledge, there are two paper (or card) models of the USS Arizona. The most impressive is a full-hull model by Digital Navy at 1:250 scale. It is available on CD for you to print out at home. The second is a waterline model by GPM at 1:400 scale. This model comes in the more traditional format as a booklet.